Beautiful Gnarly XS 650 Bobber Concept.. This sick XS 650 was sent in last month by Tony. 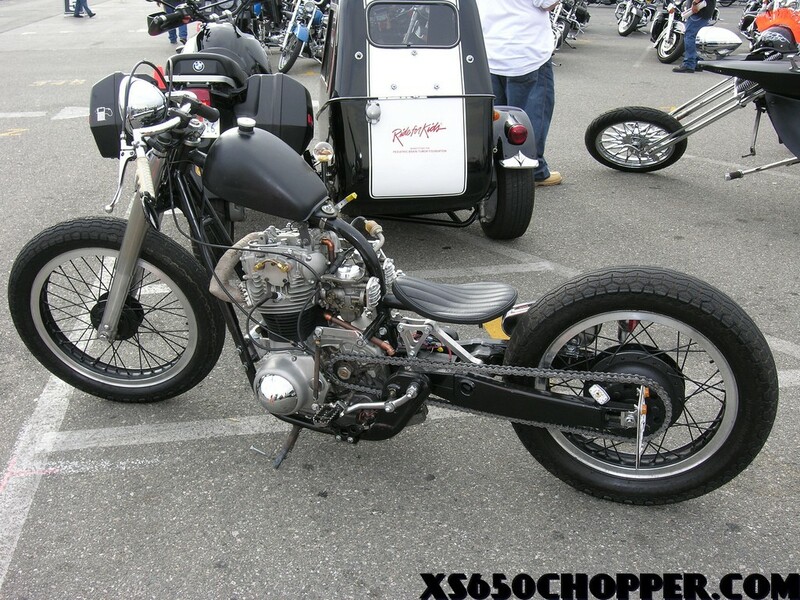 The e-mail simply had these two pictures with “Describe Your XS650: check out this cool xs650 bobber”. I e-mailed “Tony” back a couple times to get some more info on this ride but got no response. I really wanted to get the scoop on this xs650 because it’s so crazy but whatever it’s still cool. I know I’ve said it before but this is one of the coolest 650s I’ve ever seen!! There are so many little details that you notice the longer you drool at this crazy gnarly XS 650 concept bobber..
What Do You Think? Sick right? If you know any more about this Yamaha xs650 make sure to leave a comment below! Send in some pictures of your xs650 bobber if you got them. This bike is awesome! That side cover dome is very interesting. I’d like to see some more close-up pictures. Sweet ride! I just started on mine today. got most of the hacked wiring harness marked off and took the fenders and signal off. i like the swingarm. What sportbike did it come off from? If I were to take a guess, I’d say that’s an FZR600 swingarm. COOl…angry samoan.. I just e-mailed your son..
Ted — i sent new pic’s — did U get them? Did you use the form? Ted — check your email Bro! Very nice! It’s refreshing to see something different from this genre. Well, I know for a fact you can get those chrome bullet covers from Nightprowler’s, that’s a rod and custom parts house. they were originally designed by Gene Winfield in the 50’s, and are used to make car grilles, replace wheel and hubcap centers, and steering wheel horn buttons. They’re sold in several sizes…….Real cool lookin’, huh? Can we some post of that thing in motion, I would like to see how you fit on that thing? It would be cool to get the break down on this bike, the swingarm is just insane and now my head is spinning.. Im starting a build myself and really would like all the info on this.. I would really, really…no, I mean REALLY like to see how that rear suspension is set up. I like the way builders come up with awesome fabrication, it personallizes it to it’s owner. As well as Butch, I can figure how your suspension works. Could you please take me out of my (pain) and tell me how you created this fantastic feat. By the way if you haven’t notice I love your that bike of yours. Thank you for your time. i like a lot about is.it’s a nice looking bike. as an observation i think i would have forward controls since the seat is so low. gotta do something with the limbs!the gas tank. stop for gas rather often. no brakes.from what i see. i really like the fork covers or what ever that is. i like the swingarm, where is the load ? on the cleavis of the link? hey..that’s johns bike, that bike is way gnarly. the owner of the bike is super chill and knows his stuff.